Just a hop away from campus. Hopscotch Coffee is the newest edition to Bloomington’s coffee scene, just turning one this past October, but it hasn’t taken them long to establish a reputation for unique and flavorful drinks. 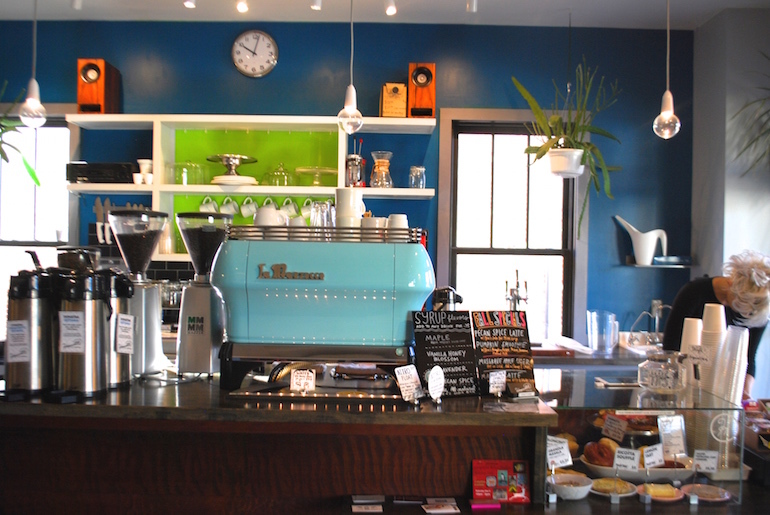 Tucked alongside the B-Line trail, you’ll find them roasting coffee in shop almost everyday and crafting smooth espresso drinks from their beautiful teal Marzocco espresso machine. 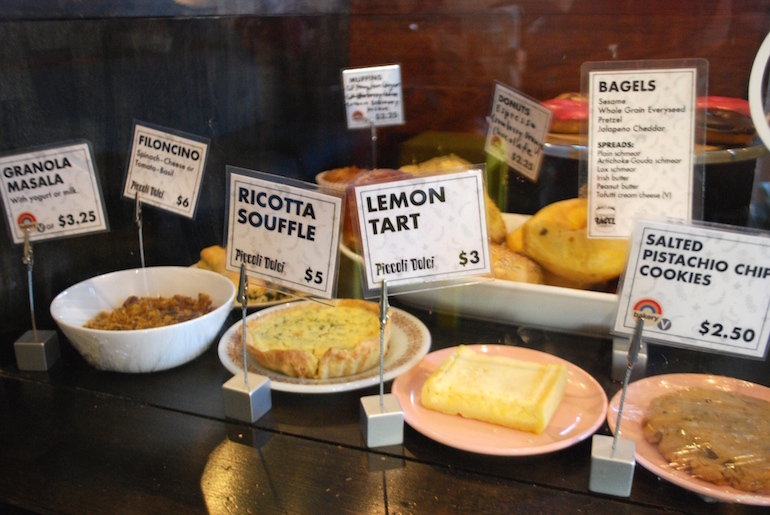 In addition to drinks, you can find goodies from local favorites Bloomington Bagel, Piccoli Dolci (must try their cornetto), Rainbow Bakery and syrups made from Bea’s Soda Bar. 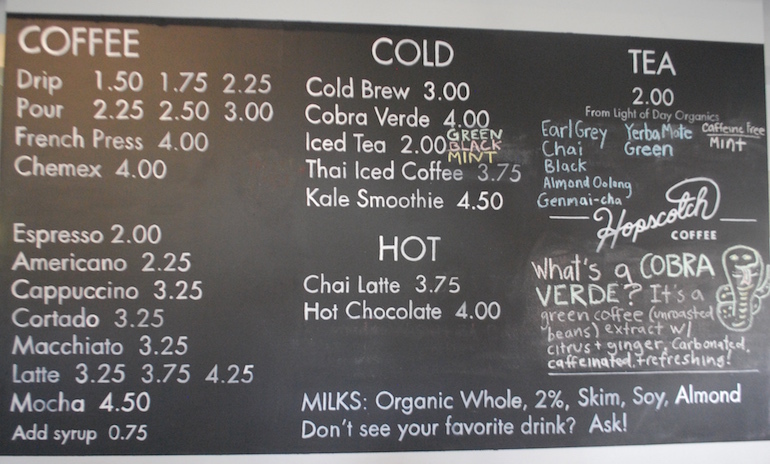 If you’re in the mood for something other than coffee you must try their Cobra Verde. This is the only place you can get this mellow drink. It is a green coffee extracted drink with ginger and citrus flavors that is perfect for cooling off in the summer. A Cobra Verde will give you a long and mellow caffeine ride without the dehydration. Of course, any of their espresso drinks are excellent choices. Their espresso machine gently steams and extracts to get a perfect shot of espresso every time. 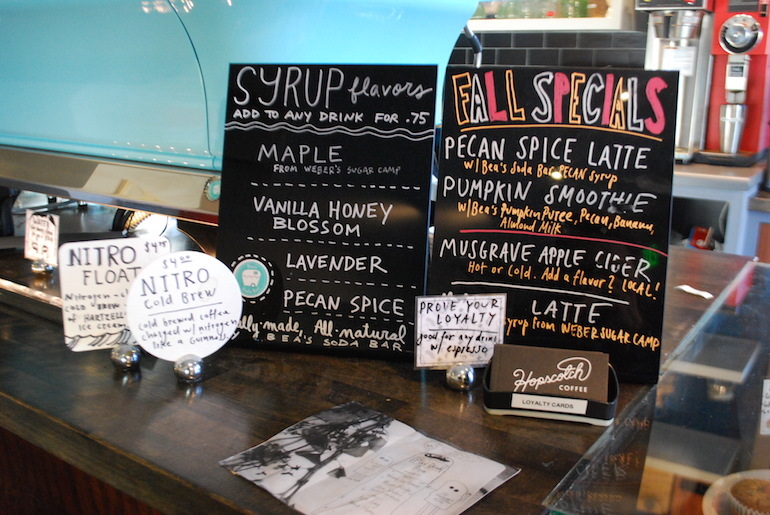 Right now they have seasonal specialties like the pecan spice latte and maple latte. If you follow Hopscotch on Facebook, Twitter or Instagram you will notice that every few weeks they host waffle Sunday. A new menu is offered every time and features three different types of gourmet waffles: two are usually sweet (think pecan gingerbread waffle with sweet lemon butter and smoked maple) and one savory (like the jalapeño cheddar cornbread waffle with pulled pork). Order one of these with your drink and you will be all set for a couple hours of studying at Hopscotch. Hopscotch is also excited to announce that they are expanding into the space next door. This will double their seating, leaving more space for customers to hang out and enjoy the indoor or outdoor seating at the coffee shop. The expansion should be ready by January, just in time for getting into those second semester study habits.